I get lots of emails and questions about how I do things in my classroom. There is never a day that goes by that I don't learn something new or get a tip from another teacher in my school, on IG or FB or in blogland. Do you ever have those "duh" teacher moments? I do. Daily. This was one of those "duh" moments. My friend Stacey over at Teaching Ever After is also doing my handprint calendar with her class and even her own children. Check that out here. We were having our weekly grade level meeting discussing who has what paint and when are you doing this...when are you doing that...etc. We all had different ideas on how to get this done efficiently with little teacher or student frustration. Stacey decided to bind her calendars first! Unfortunately, I had already started BUT paused my class from gluing. Binding the paper first is genius. GENIUS. I will no longer be losing my mind trying to mentally figure out which way to glue the paper when you flip the page...that hurt my brain! I have been doing this calendar since I started teaching over 11 years ago and have never thought of this. Was it always this cute? Um, no. 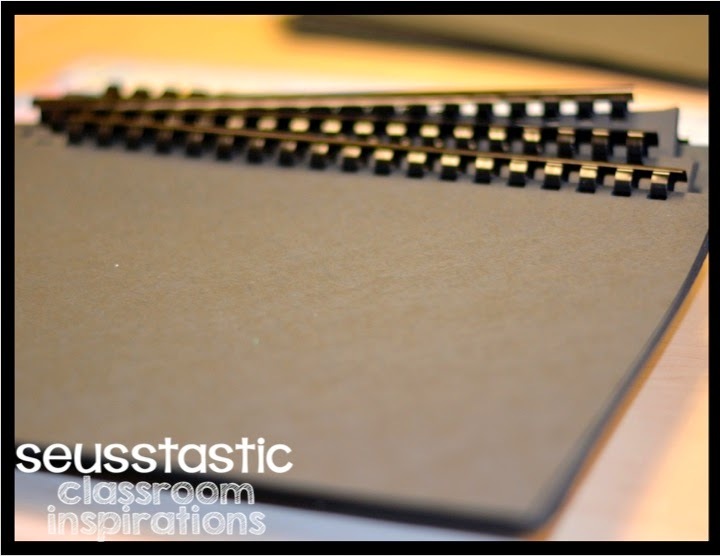 This was my feature product when I was in the TPT newsletter in 2011 and it was not even near as cute as it is now! My point is...I am always improving and changing things from year to year. This is natural and everyone needs tips, right? Another tip is to stay organized. It's so easy to whip papers on top of your desk in a hurry. Trust me, I do it ALL.THE.TIME. If you stay organized with this calendar, it's so much more manageable. 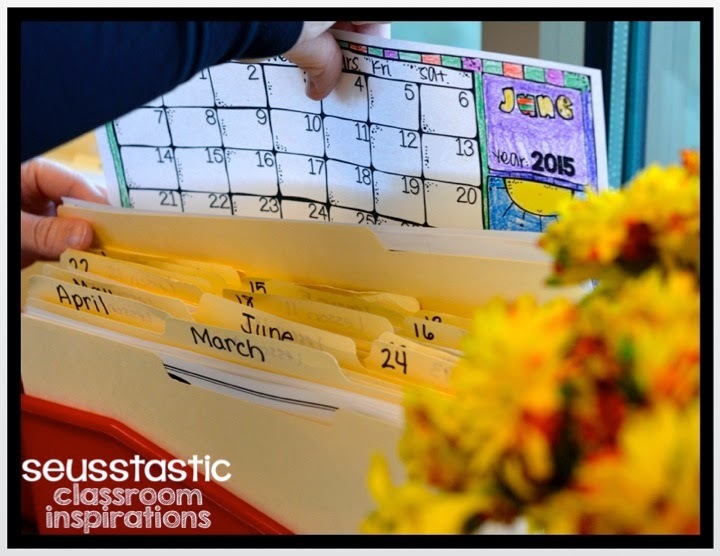 I keep myself organized by placing the students work in their numbered file folders right after they finish. We are doing the calendar in order so they are placed in order as we finish. I did this last year as well. Each monthly file has the calendars as well as extra copies. This is Stacey's calendar from last year. She did this with her 2 and 4 year old. Each of them did a month and she wrote their name in the bottom right hand corner. She printed the calendar out on cardstock in color so she didn't have to glue the finished product on construction paper. I would love to be able to do this with my students but it's just not in the budget. 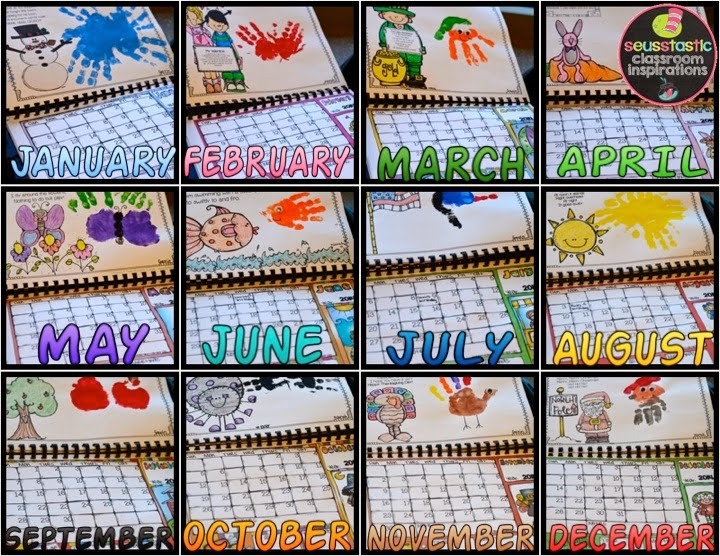 Another tip if you are doing this with your own children is to make one calendar. 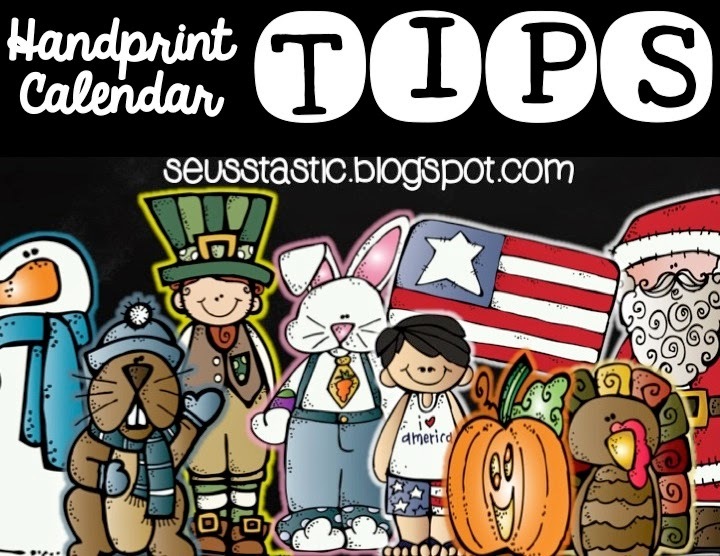 Make color copies of each handprint page and give them out to multiple relatives. This is the perfect gift while your littles have those tiny handprints! The gift that keeps on giving all year long! I did not even start this project with my 24 students until after Thanksgiving last year. Remember, I also moved schools! It is possible if you stay organized. Have a wonderful T-day all you turkeys!